"The key to a great pastry cream is using the minimum of starch. You need enough so the cream holds a shape, but not so much it interferes with the flavor. This version uses cornstarch; just be careful not to keep cooking it once it has thickened. This is perfect in Napoleons, pies, tarts, or cakes." Place whole egg and 2 egg yolks into a mixing bowl. Add sugar, corn starch, and salt. Whisk together completely until mixture turns from yellow to a very page creamy color and is slightly thickened, 5 to 8 minutes. Place milk in a saucepan. Split vanilla bean lengthwise. Scrape the cut side with a paring knife to extract the seeds (paste). Add the seeds to the milk. Heat over medium-high heat, stirring occasionally, until milk just barely starts to simmer and a few small bubbles appear on the surface. Remove from heat. Whisk hot milk into egg mixture, starting with a small splash then incorporating the rest. Pour mixture back into saucepan. Place pan over medium-low heat and continue to whisk until mixture begin to thicken, 3 to 5 minutes. Remove from heat and let it cool 5 minutes. Add chunks of butter and whisk until butter melts into the warm milk mixture. Pass mixture through a fine mesh strainer to remove and chunks of cooked egg or vanilla seeds. Cover surface with plastic to keep it from discoloring; refrigerate until thoroughly chilled 2 to 3 hours. Easy pastry cream made with a real vanilla! Tip: Save the scraped pods, and stick them in your sugar container for lovely, vanilla-scented sugar! To use this cream as Napoleon filling, here's Chef John's recipe for Mille Feuille, or Napoleon Pastry Sheets. 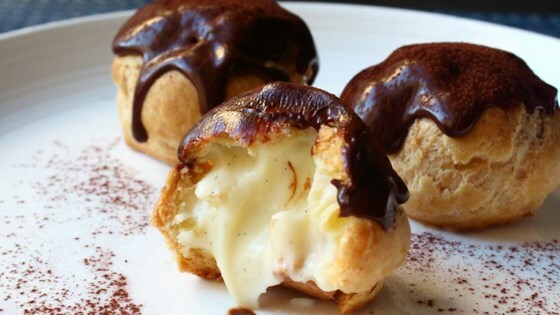 To use it in cream puffs, you can lighten it by folding in whipped cream. Whip about 3/4 cup of heavy cream until medium peaks form. Fold it into cooled pastry cream. Get the recipe for Cream Puff "Crack Buns" (Choux au Craquelin). I don't know what I did wrong. Are you sure the recipe needs one whole teaspoon of kosher salt? I followed the recipe EXACTLY with fresh ingredients and it seems too salty. I only did a pinch of salt BUT this turned out really well. I ended up whisking step 1 much longer than it states. It was easy enough to make too, just show no fear like Chef John says! I followed exactly but I, too, felt it's too salty. I will no doubt make it again but reduce the salt.